The start of the school year saw this year's teachers strikes spread to Washington. Teachers across the state defied court injunctions and won large raises — and set the stage for a potential strike in Los Angeles. Fifteen districts started the school year on strike in Washington state — the latest to ride the West Virginia wave. “For my whole life I thought this was just the way it was, that I would have to struggle to have a sustainable life,” said Anna Cockrum, a teacher in Evergreen, out on her first picket line. “I teach students to stand up for themselves, and it is so cool to be living that. Teachers launched rolling strikes in 2015 to push for the additional funding. Three years ago, the court held the state in contempt and issued fines of $100,000 a day for failure to comply with its ruling. Finally, six years after the initial ruling, the legislature has addressed the last of the court requirements and approved a budget that included an additional $2 billion in funding specifically for educators’ salaries. The Washington Educators Association, which represents the vast majority of K-12 educators in the state, encouraged members to demand significant raises — upwards of 15 percent for teachers and 30 percent for support staff. The union supported the strikes, publishing updates on its website, joining solidarity rallies, and adding staff to embattled locals, according to Richard Wood, a WEA communications staffer. Caucus members were frustrated that the district’s final offer of 10.3 percent was well below the state average — in a city where the cost of living was already driving teachers to other districts. 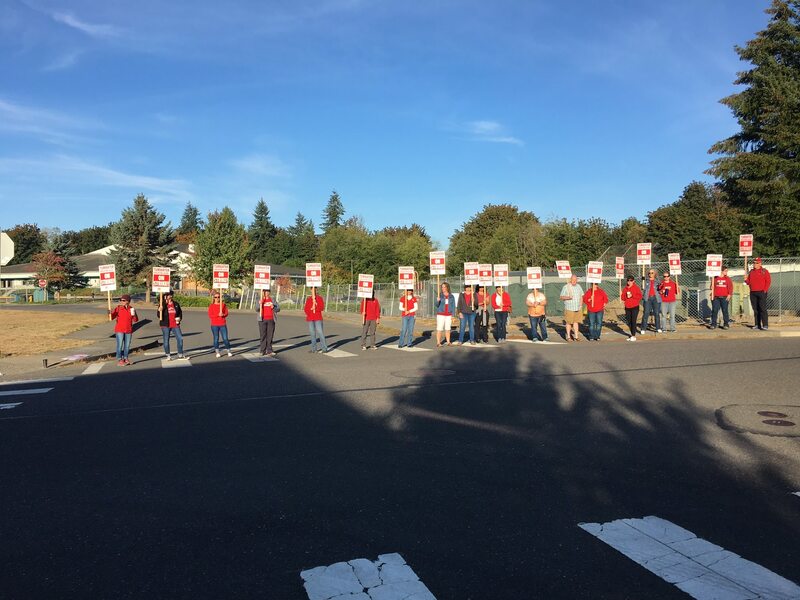 As teachers reached deals in some districts — with or without strike authorizations — anger rose in the districts where management was stonewalling, bringing paltry offers, and making false claims about the funds available. “I have never seen such an informed membership in [my] twelve years in this district,” said Shannon Ergun, a bargaining-team member in Tacoma. All this attention threw into relief a lack of transparency from leaders in some locals — usually because they had agreed to ground rules that prevented them from disclosing bargaining details. In North Thurston, teacher Megan Little couldn’t find out much about offers and counteroffers on the table. Finally, at a general meeting, after the bargaining team shared as much information as possible within the ground rules, members voted 98 percent to authorize a strike. “When I realized that the district was not going to pass along the McCleary money and looked at my salary increases compared to the salaries downtown, I just couldn’t do it,” she said. Among the district’s ten largest school districts, Tacoma has the highest administrative expenses. Salaries for its senior executives have soared in recent years.